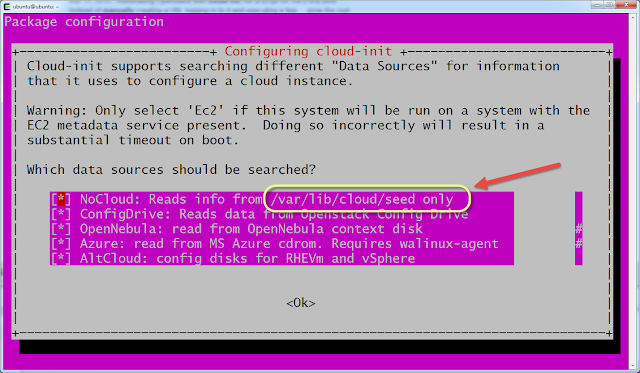 The basic idea was install cloud-init on a non-cloud install of Ubuntu. Then to create a meta-data and user-data file at /var/lib/cloud/seed/nocloud-net then reboot. 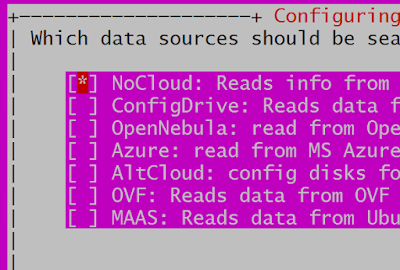 The user-data file is the cloud-config file and the meta-data file is some presetting that I got to work partially. Why would I do all of this? I am used to using the AWS cloud or OpenStack, both of which support cloud-init. I am planning on building an OpenStack box at home… someday… but I keep getting delayed with life. In the meantime I do have an ESXi box built out and running at home. It works great. But boy do I wish I had a simple nice interface or command line tool that would allow me to tell it to build a box of X size and run this cloud-init file. 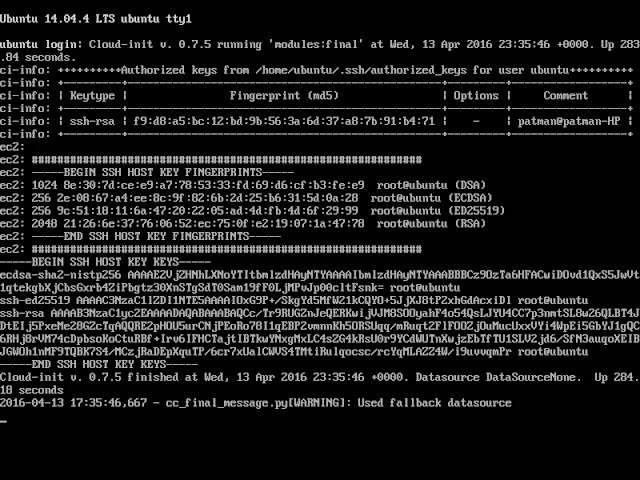 Running cloud-init locally I can kind of get that working well enough. But I think I can one up it. From what I have been reading I think I can set cloud-init to grab the meta-data and user-data files from a URL. 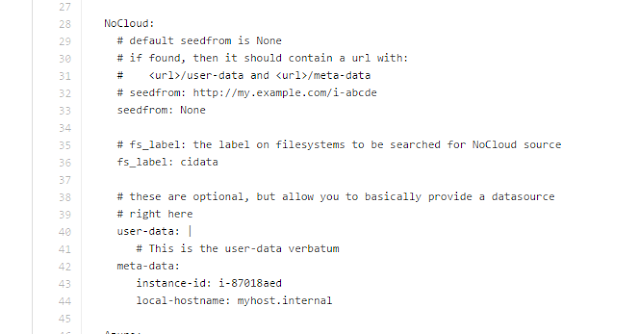 If I can get that working I can put all my meta-data and user-data files in a git repo, for tracking, then put the repo files on an internal nginx server I can link to. Then I just have to edit a cloud-init config file to point in the right direction and I am good to go. First I want to show how to get a local simple cloud-init working on a fresh Ubuntu 14.04 install. 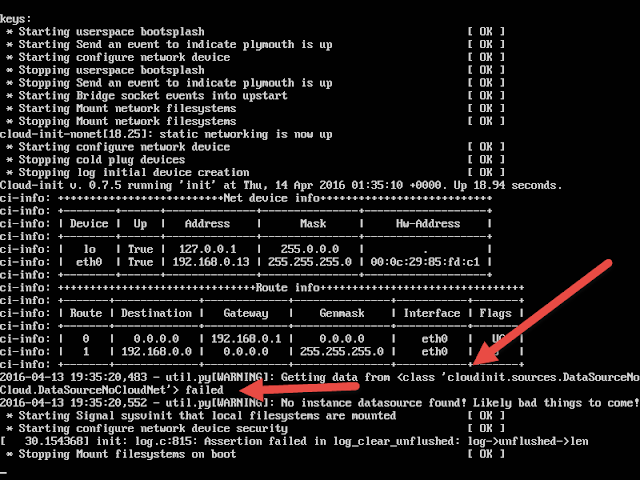 This section tells it to reboot after cloud-init is done. This section is creates groups. I am creating a group for my user that has the same name as my user. In this section you can add your user and get them set up the way you want. I've set up the default shell, my primary group, my password (as taken from /etc/shadow), and my ssh public keys. Runcmd basically defines a bash script to run. 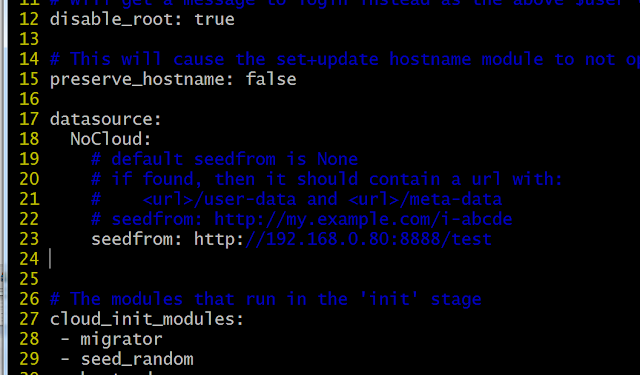 This is useful to do some setup that otherwise can't be done in other cloud-init modules. This particular runcmd would result in this bash file being created and run. These command unlock the user patman (who is created in a locked state). It also updates the /etc/hosts file to add the new hostname to it so you don't get that annoying warning when running sudo commands in Ubuntu. This section creates a new /etc/network/interfaces file. In my case it will set a static IP address to 192.168.0.75 on a reboot. Now, I should also be able to login as patman at the static IP address. OK that is all working… Now to figure out how to move it to a URL and get cloud-init to use that URL. You can come up with your own idea on where to store stuff but here is my method. I happen to have an nginx server running on one of my local machines. I am going to make a directory there and set It up to listen on port 8888 (which in my case is not available outside my network). I added this section to it. Within /nginx/cloud-init I think I will eventually create some folder structure that makes sense for me and my servers. But for now I will just make a test folder there. I think it should be ready now. Now back to a very fresh install of Ubuntu 14.04. Looks like that is working just fine. Looks like I can add a NoCloud section to the datasource section and point it to my URL. Scrolling down a little I can see this datasource section that is commented out. Here is what I updated mine to. OK that failed miserably… It took forever trying to get data from EC2 urls that were not there then finally got to here and kinda got into a wonky state that wiped my passwords so I could not get in. I can see that all the different datasources are listed. Also I see a command I can run to change that. Interesting I can set this here… But it looks like if I use NoCloud option it won't use the URLS? Maybe the URL option for NoCloud is a version 0.7.7 cloud-init thing and 14.04 is running 0.7.5? But at any rate I am going do deselect all but NoCLoud and hit OK.
Add in the following again. Reboot, but I have a feeling it will not work. I found the issue !! I think I found the issue! One tweak and it is working!